30 Nov 2017 - Sgt. Ron Yitzhak Kokia was stabbed to death in a terrorist attack while waiting at a bus station in the southern Israeli city of Arad. Sgt. Ron Yitzhak Kokia, 19, of Tel Aviv, was stabbed to death on Thursday (30 November 2017) in a terrorist attack while waiting at a bus station adjacent to a local mall in the southern Israeli city of Arad. His assailant stabbed him multiple times and fled the scene. Kokia was able to stumble outside to look for help before collapsing on the road nearby. A driver passing by stopped to help him and called the paramedics who were unble to save his life. 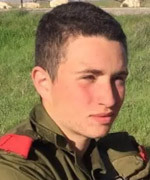 A soldier in the Nahal Brigade whose home base is located just outside Arad, Ron was posthumously promoted to sergeant. He was laid to rest on Sunday (3 December 2017) in the Kiryat Shaul military cemetery in Tel Aviv.